﻿ Granting Rivers Legal Rights: Is International Law Ready for Rights-Centered Environmental Protection? In international law, legal standing is principally employed to distinguish between those entities that are relevant to the international legal system and those excluded from it. Current international law conventions do not give legal standing to water resources. Instead, international conventions—such as the Convention on the Law of Non-Navigational Uses of International Watercourses—mainly address water management from the perspective of the participating states. Similarly, European legislation on freshwater resources, such as the Water Framework Directive, recognizes the importance of protecting water resources, but views them entirely as natural resources belonging to states. India’s Ganges River and one of its main tributaries, the Yamuna River were granted these same rights. The high court in the northern state of Uttarakhand—not the national government, as in New Zealand, Ecuador, and Bolivia—issued the order, citing the case of the Whanganui in establishing that that the Ganges and the Yamuna should be accorded the status of living human entities. These rivers now have the right to representation in the form of “guardians” or “allies” in legal proceedings against threats to their wellbeing, such as degradation. Like a charitable trust or society, these rivers can have “trustees” looking out for their best interests. Like people, these rivers have the right to sue others, seeking to force communities to take better care of the river, or face penalties. Critics argue that these rulings could set precedents for granting rights to other natural entities such as forests, mountains, and deserts, inviting lawsuits to protect resources from degradation. Some critics have even pointed to extreme spin-offs in which stones and pebbles could eventually sue people for stepping on them. Defenders reject this view, and say the point is to protect the ecosystems human life depends on. The practical implications of these legal innovations are not clear yet, but the stage is being set for an interesting comparative study: How does legal representation for rivers play out in different social, ecological, and economic contexts? The Whanganui River is a relatively pristine ecosystem—especially in contrast to the heavily polluted Yamuna and Ganges rivers. Each day, 1.5 billion liters of untreated sewage enters the Ganges River, and many attempts to clean up the river have failed over the years. Will the river’s legal status improve this situation? The governance challenge in India is significant: the limitations of a state court’s control over an environmental resource—which is by its very nature inter- jurisdictional—become clear. Furthermore, there are no financial resources to support the implementation. In New Zealand, however, financial redress of NZ$80 million was included in the settlement, as well as an additional NZ$1 million contribution towards establishing the river’s legal framework. Are Transboundary Rivers People, Too? The international treaties that govern transboundary rivers focus on the participating countries’ rights and entitlements, to ensure that one riparian country’s use or management of the river does not negatively affect the rights of another riparian. These international agreements rarely grant rights to individuals and local communities—and if they do, they usually only address access to information, public participation in decision-making processes, and access to justice. In the transboundary context, the concept of trusteeship might be useful. According to the public trust doctrine, a nation has a legal duty to protect its natural resources for the public interest and for the common benefit of present and future generations. International rivers could come under the protection of the public trust, and local communities would be both owners and beneficiaries of the trust’s interests. In 1998, for example, Melanne Andromecca Civic proposed that the United Nations Trusteeship Council should be charged with the management of the Jordan River. It is not clear whether these are the first steps towards a new international norm in the coming years. It is however clear that an anthropocentric view of the environment is, in some circumstances, being replaced by an eco-centric perspective—at least in some countries. The anthropocentric and eco-centric perspectives can go hand-in-hand. For example, in 2018, the Inter-American Court of Human Rights recognized, for the first time in international law, an autonomous right to a healthy environment under the American Convention. Moreover, the Global Pact for the Environment, an initiative launched by France during the 2017 UN General Assembly, affirms this right in its first article. This double movement—on the one hand, recognizing the human right to a healthy environment, and on the other, the rights of nature—are both means to enhancing the legal protection of the environment and to “humanize” it. Granting legal personality to transboundary rivers may reinforce their environmental protections and strengthen the rights of riparian communities. National laws and jurisprudence could pave the way for new features in international legal frameworks that will take into account the granting of rights to shared water resources. Dr. Mara Tignino is a Reader of International Law at the Faculty of Law and the Institute for Environmental Sciences of the University of Geneva. She is also Coordinator of the Platform for International Water Law at the Geneva Water Hub. Dr Tignino has been Visiting Professor in various universities, including the Renmin University of China, the University of Barcelona, the LUISS in Rome and the Catholic University of Lille. She has also been Visiting Scholar at the George Washington University Law School in Washington D.C. Dr Tignino acts as an expert and legal advisor to States, international and non-governmental organizations. Laura Turley is a PhD Candidate and Teaching Assistant at the Institute for Environmental Sciences, University of Geneva. Her thesis is associated with the UNESCO Chair on Hydropolitics. She is also an Associate with the International Institute for Sustainable Development (IISD). 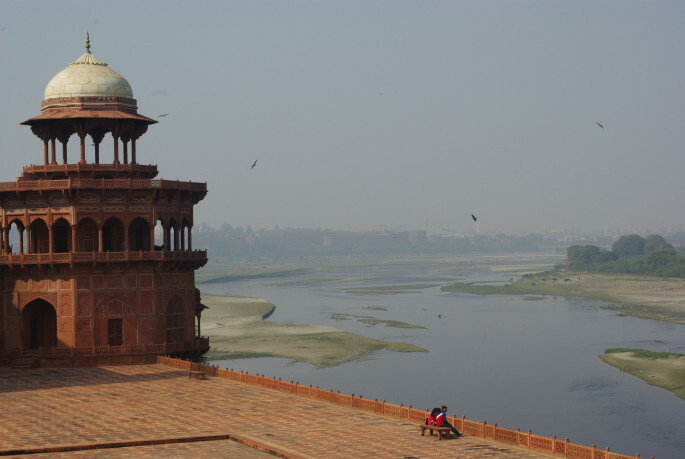 Photo Credit: Yamuna River in Taj Mahal, January 2013, courtesy of Ben Maynard.